An advantage to setting up early was that we could get this unobstructed view of our Scaredino. It was made for us a few years ago by artist Michael Melle, of Plainfield, MA. 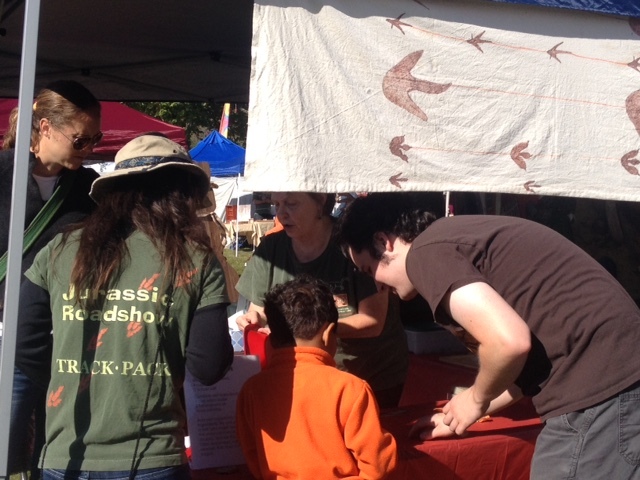 Local fairs can be great places for small museums such as ours. 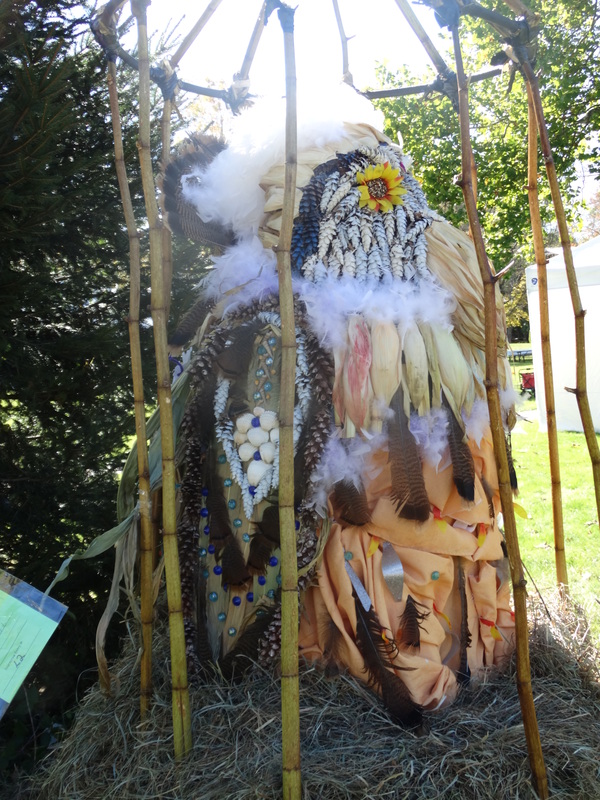 This past weekend, for example, we took part in Scarecrow in the Park, organized by the Bernardston Kiwanis Club to raise funds for a scholarship and other purposes. 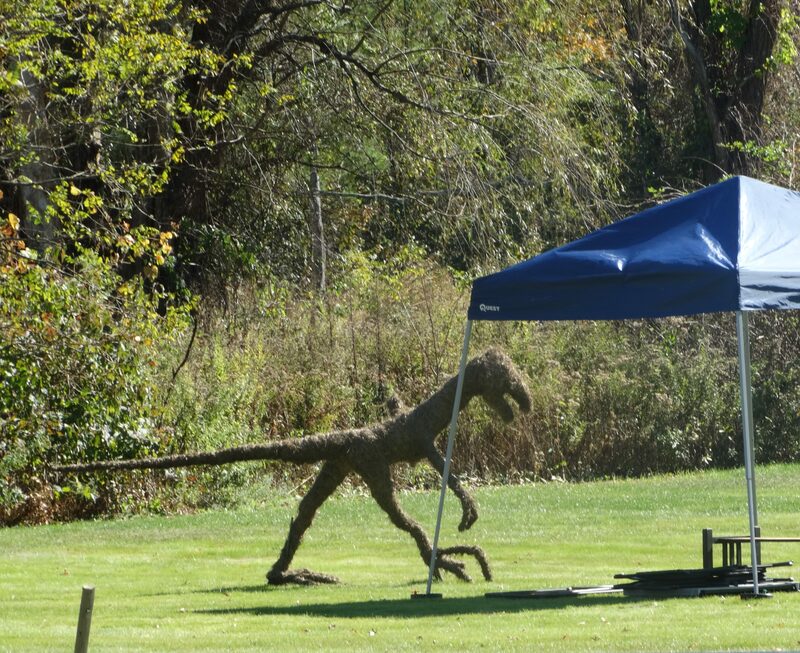 We just happen to have a straw dinosaur living on our property—with its counterpart made of metal, it guards the museum walkway—so were all set. This glorious bird was so much better than it looks here. It won the prize fore Best Use of Materials. 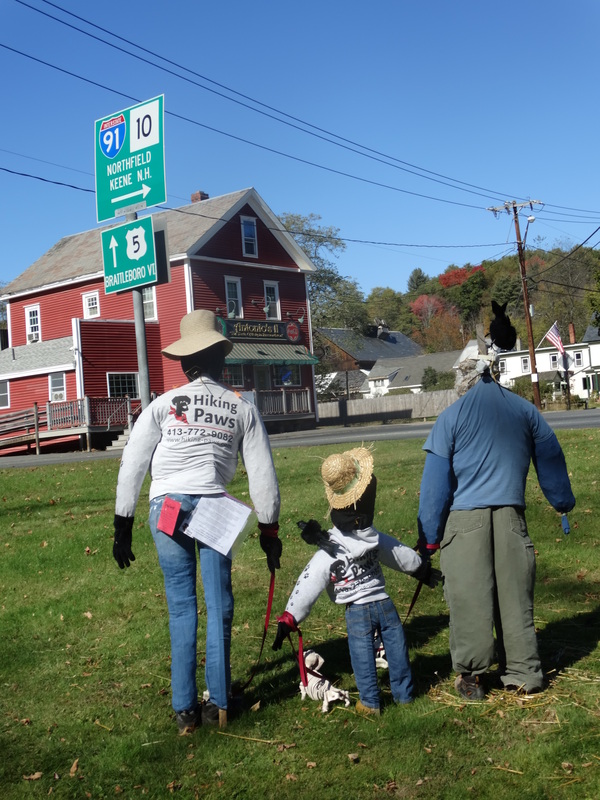 School groups, individuals, and businesses make their own wonderful contributions to the crowd of scarecrows, which go up just ahead of the weekend’s festivities and come down after Halloween. There’s plenty of imagination floating around this little town. A dog-walking family, sited conveniently near the sign at the intersection. Bernardston is just south of the Vermont border, not far from Brattleboro. Cushman Park is a patch of green at the intersection of MA routes 5 and 10, where there’s a smattering of houses and a library, bakery, senior center, the venerable Four Leaf Clover restaurant, Hillside Pizza, a small grocery store, a couple of churches, and not much else. It’s a pretty New England town. It’s only real drawback is that no dinosaur footprints are found in the rocks here. However, Rebecca Slate, the first wife of dinosaur footprint discoverer Dexter Marsh, was from Bernardston, so the town does have a connection, historically speaking. We set up the Scaredino (not his real name) right next to our tent so we could keep an eye on him. (He doesn’t bite, but you never know what a dino will do if provoked.) Loads of people took pictures of him, giving us the perfect opportunity to answer questions (mostly, “It’s a Coelophysis, which is associated with grallator tracks found around here”) and hand out our museum brochure, a map of places to see dinosaur footprints in the valley, bookmarks with the address of the new Impressions from a Lost World website, and the link to the new “Geology, Astronomy, and Dino Tracks! Oh, My!” exhibit at Memorial Hall Museum. 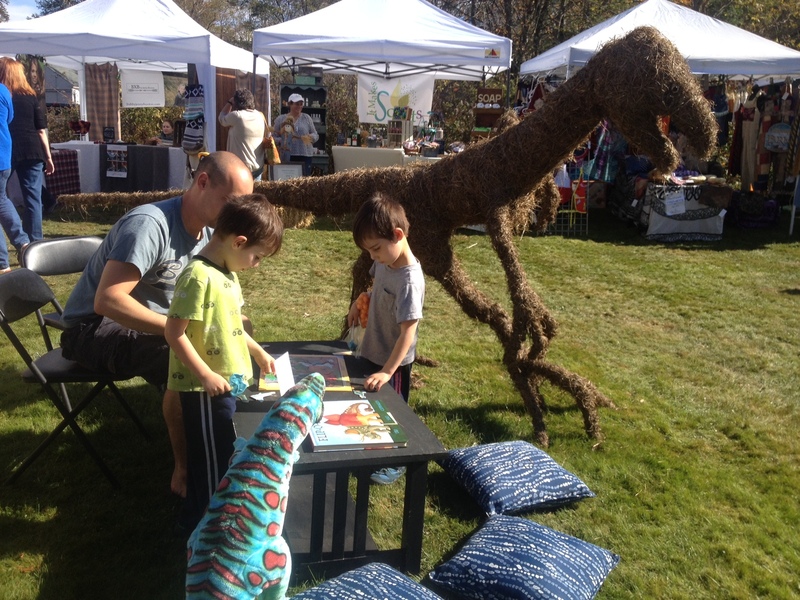 We had two free crafts: mini-scarecrows made from corn husks and dinosaur footprints in home made clay. We also had a dinosaur jigsaw puzzle and the Fliposaurus book, both of which were very popular. One little boy of about 3, who couldn’t even talk much yet, spent nearly an hour doing the puzzle, completing it twice. 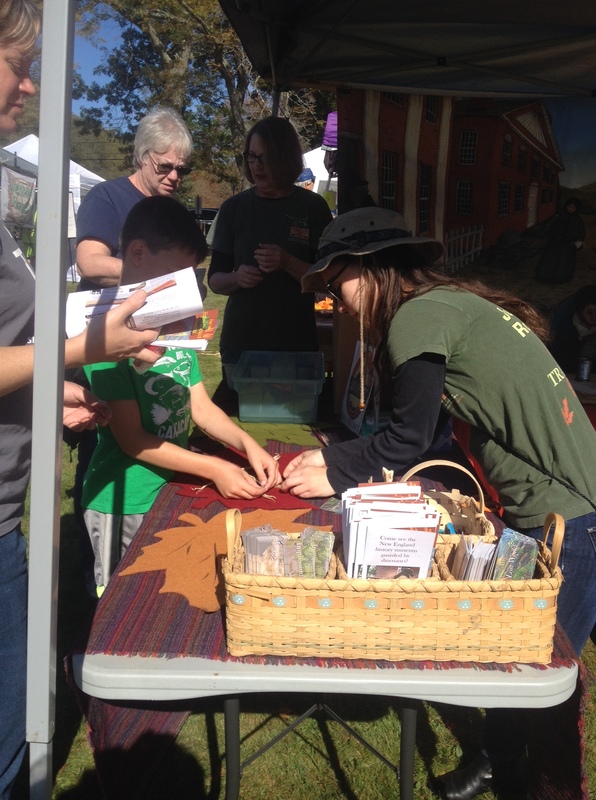 Posted in Event Write-Ups & PhotosTagged Bernardston, dinosaur art creations, fairs, scarecrowBookmark the permalink.